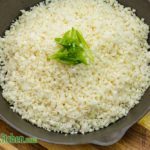 One of the most popular sides for a ketogenic diet is “faux rice”, or Low Carb Cauliflower Rice. It is super simple to make and we’ve thrown together a quick recipe to get you started. Cut the cauliflower into evenly sized florets and place into your food processor, only filling half the bowl at a time. Blend the cauliflower using the pulse setting. Continue to pulse until it resembles rice. If there are any large pieces, remove them and blend them separately. Heat a frying pan over medium low heat. Add the butter and salt, allow the butter to melt before adding the cauliflower. Saute the cauliflower for 5-8 minutes, whilst continually stirring. Remove from heat and serve. Enjoy.